Hmmm . . . just realized that my line-up of quotations above might seem odd to some of you. At any rate, they capture a bit of what is on my mind, as I begin to reflect on a couple years of remarks about collage at this blogsite. Like many others, I spend prayerful time caring for a parent with progressive dementia. 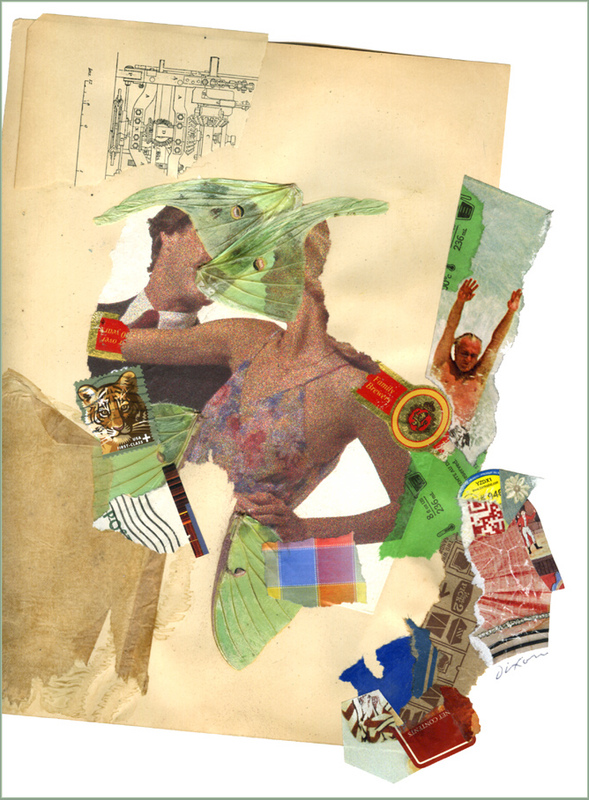 The other day I was trying to explain to my mother, in terms she could appreciate, my burning desire to make collage artwork, and, touching on her prevailing sense of confusion, talked about my creative activity as a way to bring some kind of harmony out of the chaotic stream of disorder that dominates so much of current stimuli in our daily lives. It brought to my awareness the motivation at the center of what I love to do, but also fell short of the clarity for which I was reaching. Over the next year, I hope to find better words which get to the heart of that idea — how I take what I can carry into a process that leaves thoughts behind, a kind of sweet madness that offers explanations difficult for me to achieve any other way. Of course, this is not the only approach to the medium. I hope to profile more collage artists who use a different methodology than my own — the extraordinary minimalists, the dedicated aestheticians, and those who continue to harness a kind of thoughtful irrationality that keeps me in awe. I just looked over my previous comments after a full year of blogging, and, as a result, I feel the need to temper my ambitions going into year three, but that is not my nature. 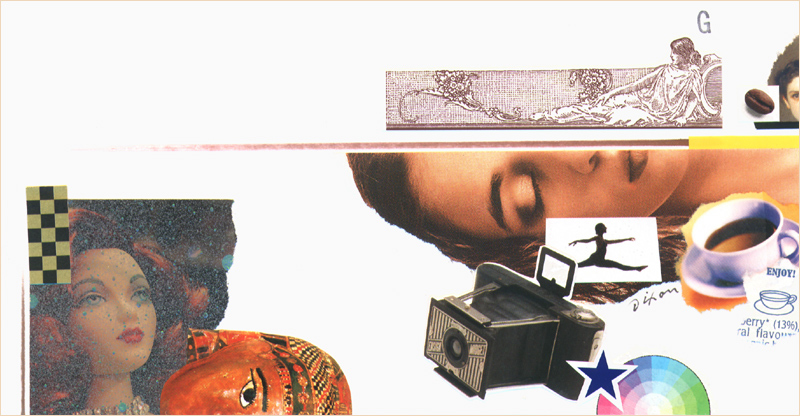 There are too many interesting things to explore in the dynamic world of contemporary collage. One of them is the continued explosion of collaboration. Another is the influence of social networks. Nearly every day I see an artist defeat the purpose of the platform with overexposure, failing to keep the age-old quality-vs-quantity issue in balance. One of my goals for the coming year is to take a closer look at how the ease of internet sharing affects the challenge of striking an equilibrium between the imperative to follow one’s passion without regard for opinion and the practical aspects of seeking recognition and approval from others. As most of you already know, it is not an easy task to walk that tightrope. And one more thing, dear visitor. Please let me know what I can do to make this site more interactive as a unique forum for discussion. Meanwhile, you can count on me to observe, write, and make more art. Stop back again! 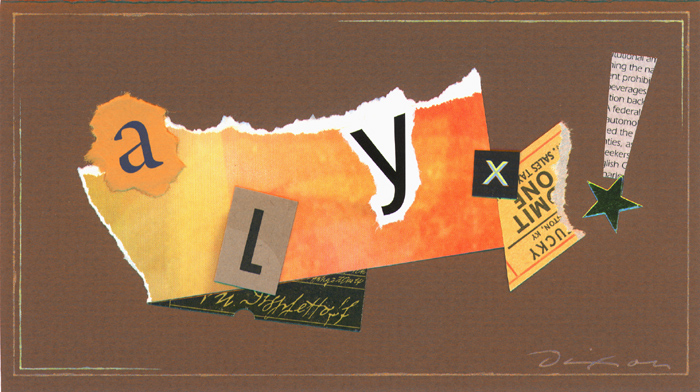 As is true with many graphic artists, I have been fascinated by letterforms since childhood. The first time I rendered the word “ICE” with frozen encrustations, it felt like a rite of passage for me. One of the reasons I shunned store-bought greeting cards in favor of my hand-crafted versions was to indulge a love affair with custom lettering. 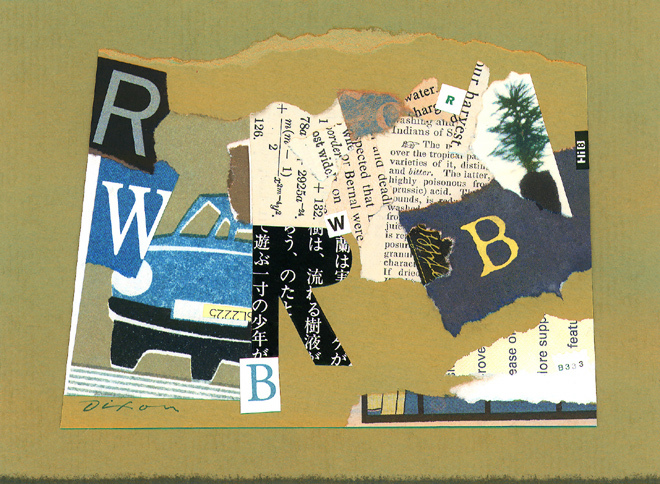 As collage miniatures began to dominate the character of my card making, the alphabet remained a key part of the visual vocabulary. 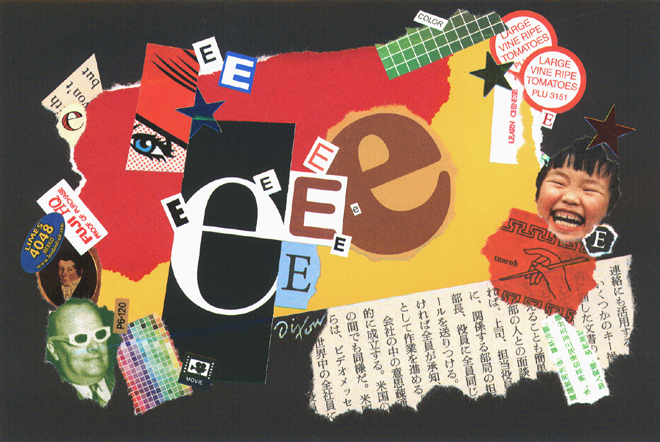 As my enthusiasm for the medium of collage continued to expand, symbolic language became a re-occurring, vital ingredient in nearly all my artistic compositions. 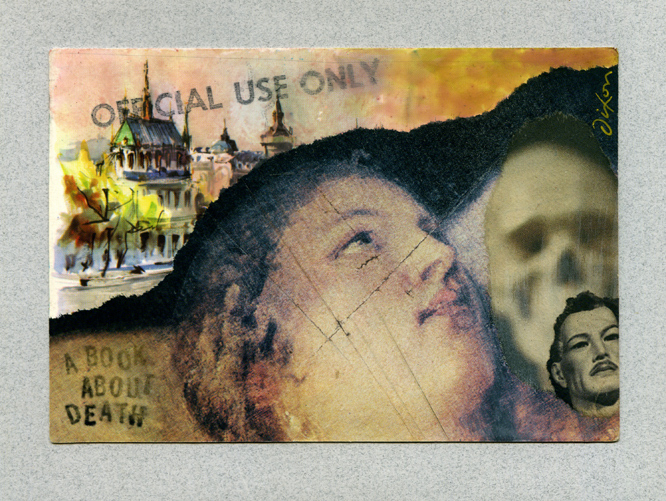 My collage on 50-year-old postcard arrived in Wales and it was posted to the ABAD site today. The reverse of the vintage card is probably more interesting than my improvisation on the image side. 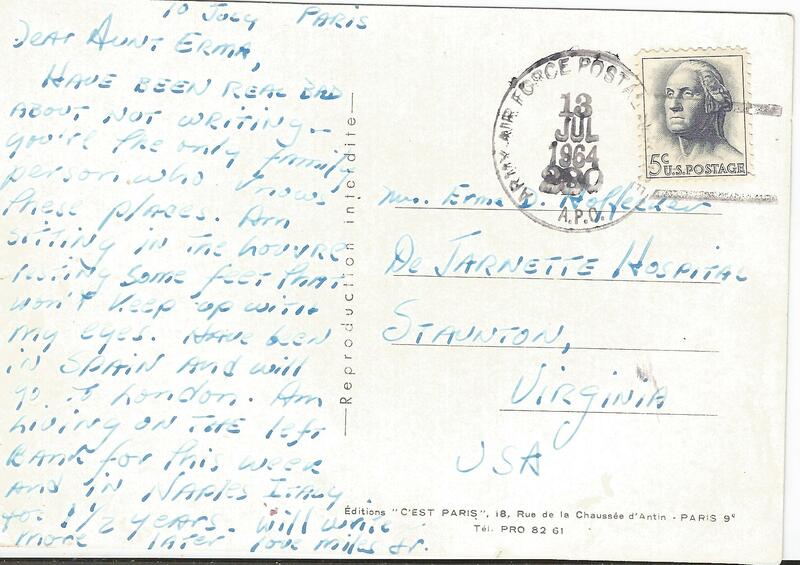 A message from Miles, Jr. (sitting in the Louvre, resting feet more tired than eyes) was written on July 10th and received an Army Air Force postmark on July 13th. Apparently his Aunt Erma was in the hospital — a nephew reaching out to “the only family person who knows these places.” Whether or not she ever came home is unknown, but we can only imagine that the card from Paris evoked for her more than a few memories of Europe, the bitter as well as the sweet. One cannot have too many influences. I am like the musician who must hear many new notes each day. Hundreds of collage images pass before my eyeballs every week, but there are times when the best catalyst is a younger version of oneself. Much can be learned by reviewing former decisions or puzzling out past intuitions. Perhaps it is all a circular mystery. No doubt the Muse would not have it any other way. With my birthday more than two months behind me, age 62 is now feeling old hat, but I have not forgotten about the gift from Ted Tollefson. 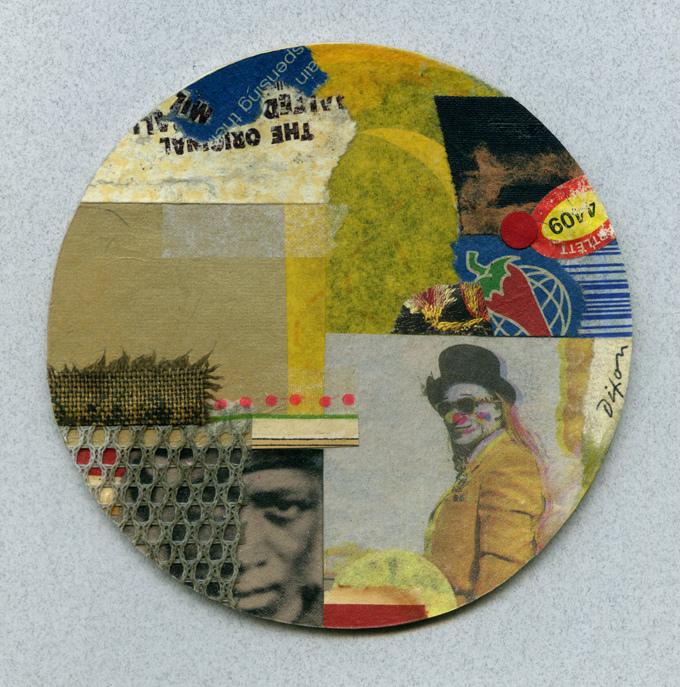 His collage on beer coaster sparked a strong desire to reciprocate. Toll Taker is the result, and one could say I was “under the influence” of his cool style. It shall be sent it to him promptly with a couple more surprises. Ray Johnson, the original “most famous unknown artist in the world,” produced his A Book About Death during the years 1963 to 1965. The pages were randomly mailed and offered for sale. Complete copies were compiled by a rare few. Johnson was a significant bridge between the groundbreaking work of Schwitters, the sensibilities of Cornell, and the emergence of what would become the most widely recognizable features of Pop Art. He was highly influential in the Mail Art, Installation Art, and Performance Art movements, as well as late 20th-century neo-Dadaist trends. Since 2008, Paris-based Matthew Rose has actively aroused a worldwide interest and vitality that perpetuates the legacy of A Book About Death. A new call to artists from the Royal Cambrian Academy in Wales and the full history of ABAD can be studied at this site. An exhibition at MoMA Machynlleth planned for later this year will include a collage from me (featured below, produced on a 50-year-old postcard). An online archive will share details of the exhibition and record artworks as they come in. Participate! You have until September 30th to mail your contribution. 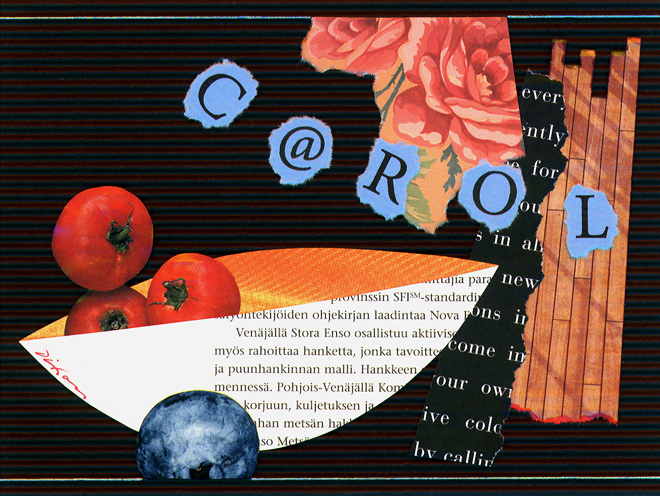 You are currently browsing the The Collage Miniaturist weblog archives for July, 2014.